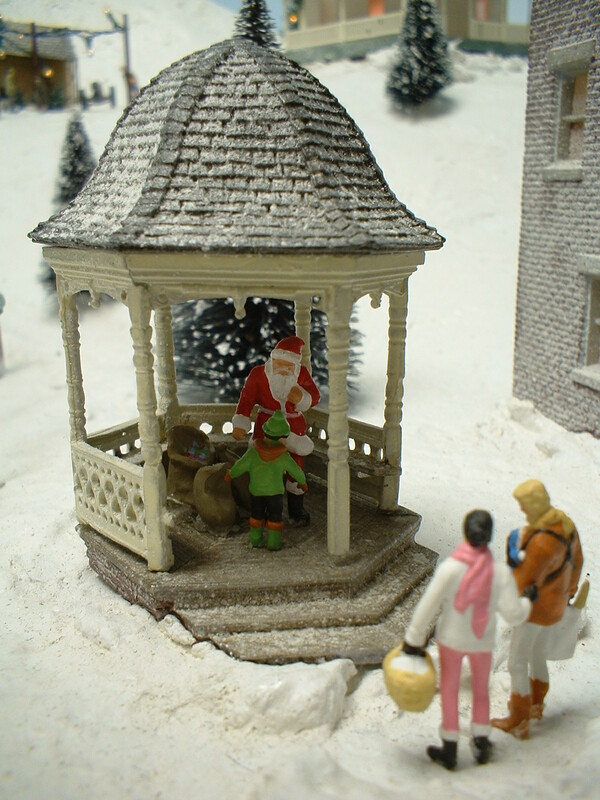 Like a lot of you, I'd wager, things are pretty busy what with the holidays and all. But I came across a really interesting blog post that gives you 3 great tips for being a "detective" in identifying historic photos. There's nothing here having anything to do with the Valley Line, but I think you'll find the info really helpful - I know I did! 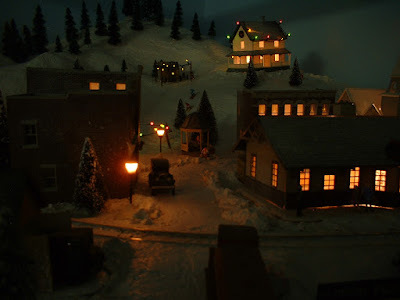 To get you in the Holiday Spirit, I'm posting some photos from my First Completed Layout Ever - structures, even scenery, done. 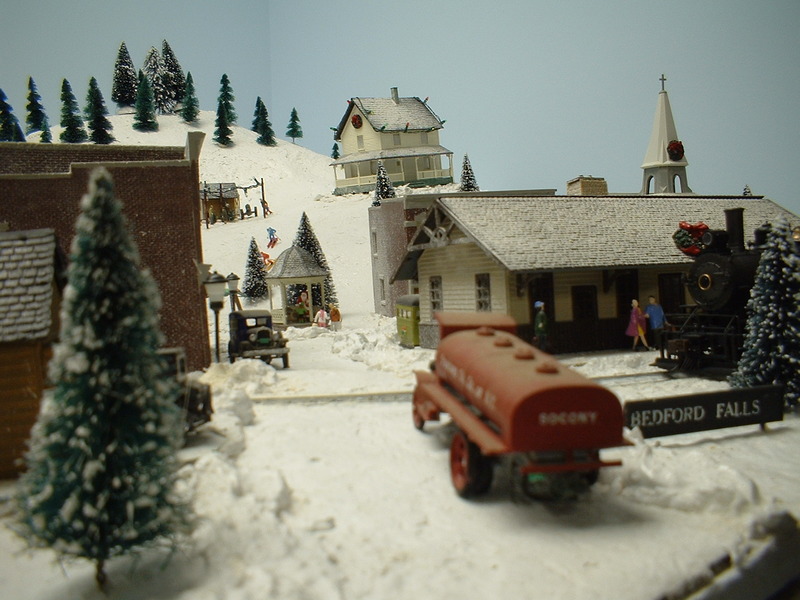 This was a Christmas layout I built way back in the mid-1990s in our first apartment. It was only 3x4' and had an 18" radius loop of snap track. 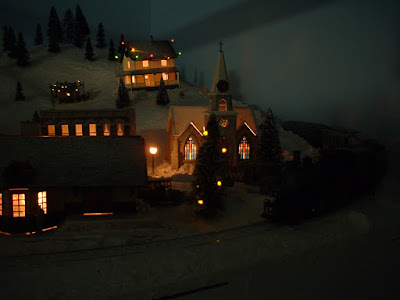 But it was finished and ran - and even had lighted buildings! 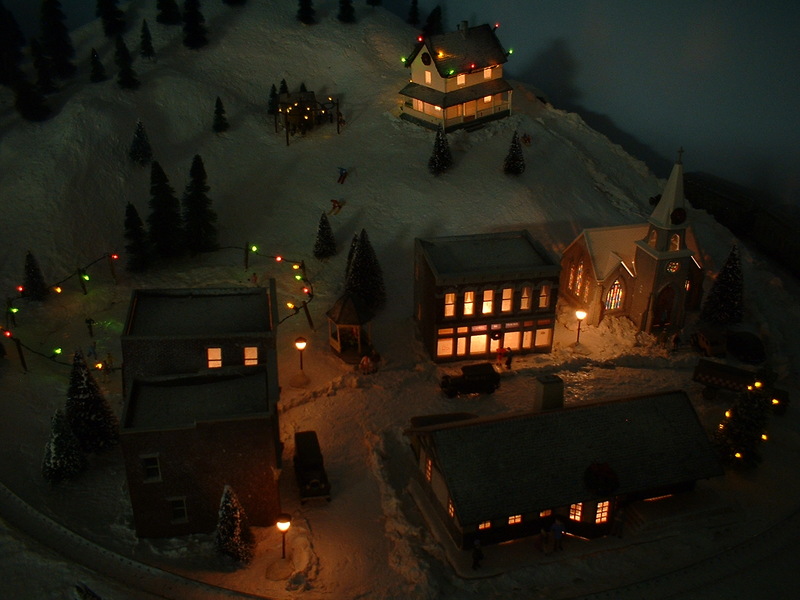 I had a lot of fun with that little freelanced fantasy layout, but with the construction of my current large proto-layout, the old Christmas layout finally got too much in the way But it will live again - reconstituted in a module/diorama that I'm currently building. And the memory of it lives still, in the photos below. Enjoy! And may you and yours have a Very Happy Thanksgiving! 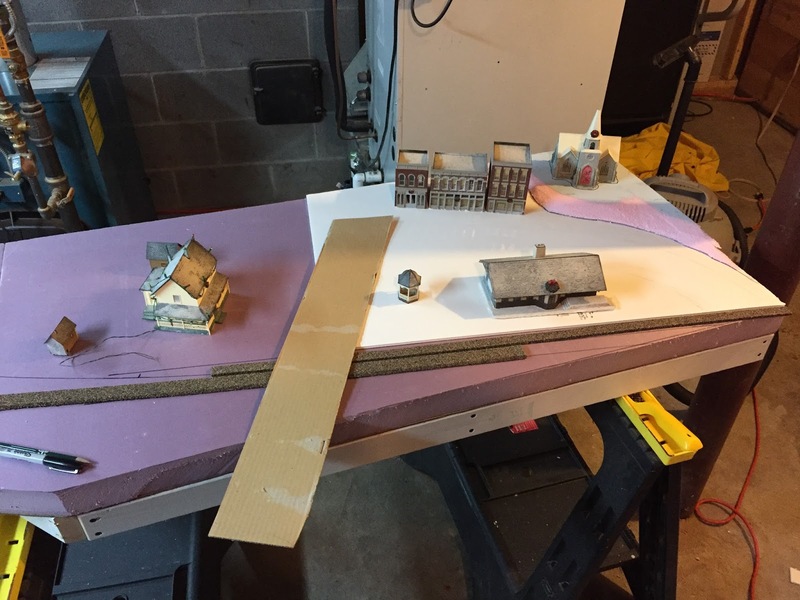 Sometimes a change of pace from strict prototype modeling and research can be a welcome break and give your creativity a chance to stretch its legs. 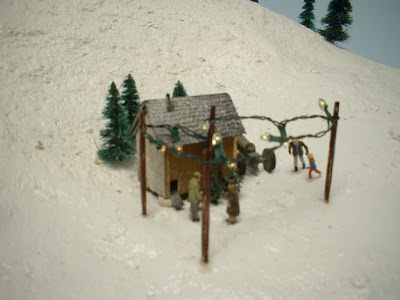 I've mentioned before (here and here) that I've started a Christmas layout (or module or diorama) using items I salvaged from a my first finished layout ever (which was "Christmas Layout ver.1"). Now that the benchwork is done and the foam is firmly glued, it was time to unpack the box o'stuff. Everything was carefully packed away after last Christmas and the layout itself taken to the dump. 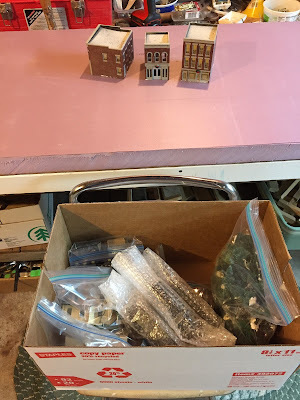 Arranging everything was pretty fun - although I noticed that not having any prototype photos to refer to makes the process a little more daunting.... SO hard to know what will look "right"
But I figured pretty early on that the "mainline" would enter & exit off the edge, rather than abruptly end at the ends. 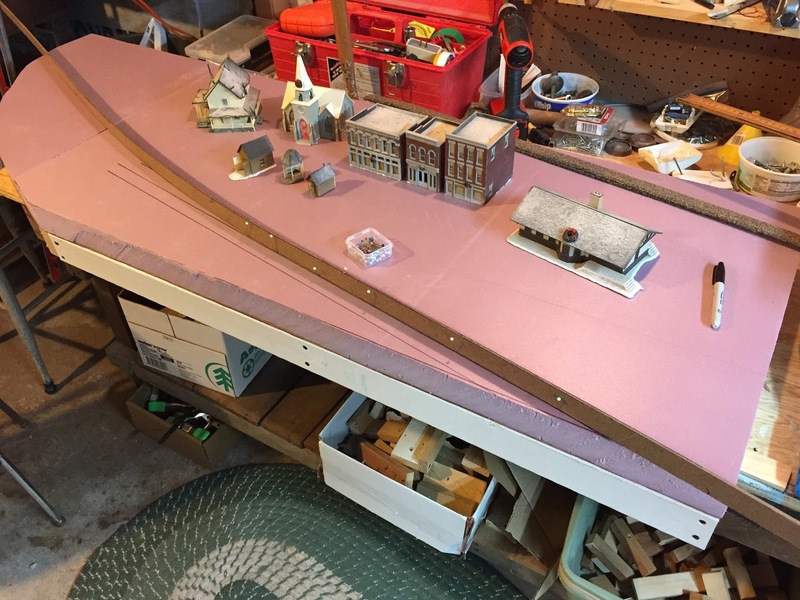 And I wanted a nice, gentle "mainline" curve, with room for a small trestle or causeway at the left end. After a LOT of rearranging, I came up with what I think is going to work for the town. Nothing too crowded, the main street will come on-scene at the lower right and go back and all the way to the left end, with a little side street (the cardboard strip) dead-ending at the track, but providing access to the house. 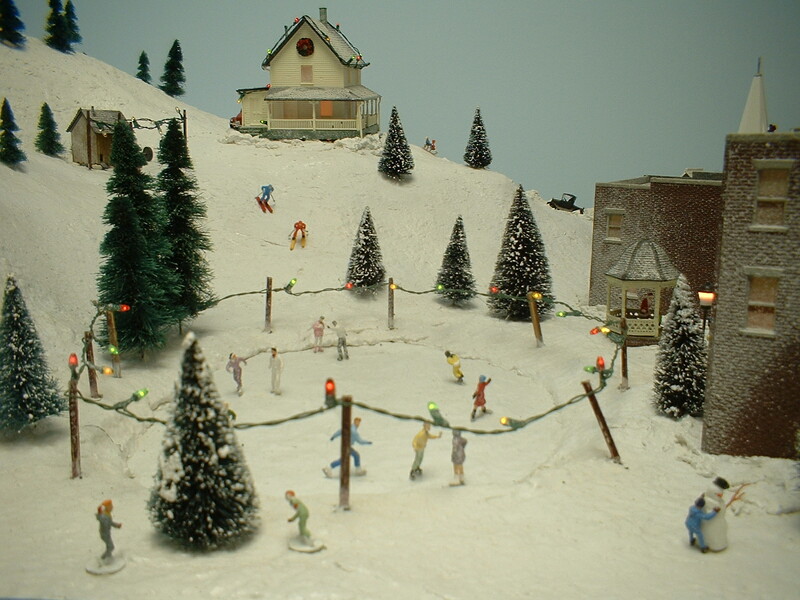 The main road will then go up and over the railroad at the left end of the scene. It's so easy & quick to put together that I was already done with the deck before I thought to take a photo. 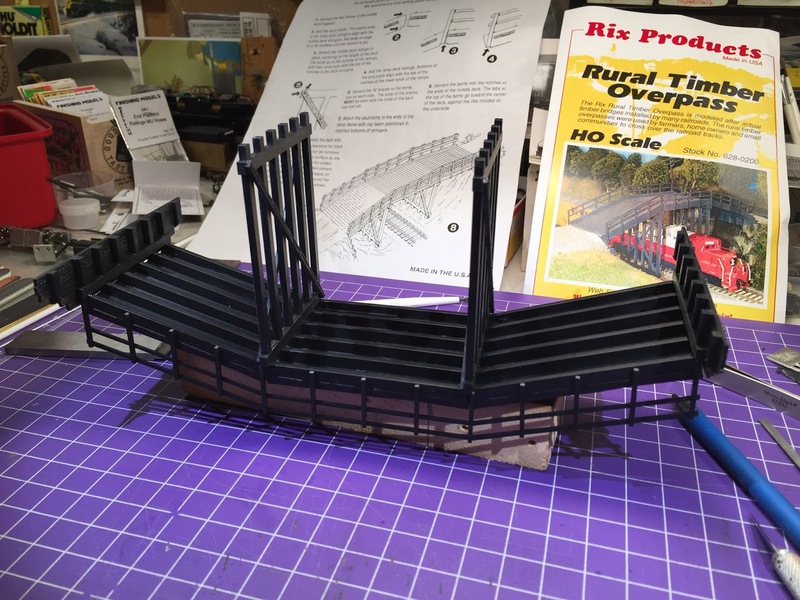 A nice, easy modeling project like this - that you can complete in an evening or two - is just the thing to reinvigorate the hobby motivation. 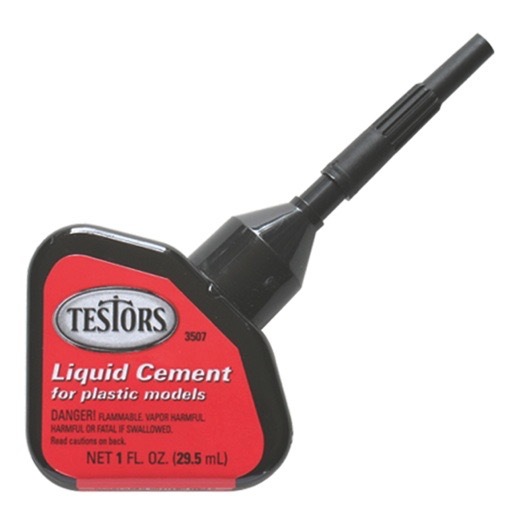 I really like this stuff - it has a higher viscosity (it's thicker) so has some gap-filling properties and a quick cure rate. The needlepoint applicator is also handy. I've been enjoying trying to dial-in the sound decoder on my DERS-2b using ESU's Lokprogrammer, but the 3' test track I've been using hasn't given me enough run to go through all the notches on the throttle or test momentum settings. So I decided to toss the test track and build a test loop. 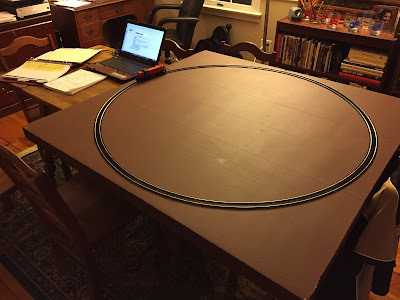 I debated for a while building an 18" radius loop - it'd take up a smaller footprint (38" square, rather than 4" square) - but the minimum radius on my layout is 24" and I figured anything that could make it around 22" radius (including certain passenger cars) would do fine on my layout. 18" radius would be overkill. 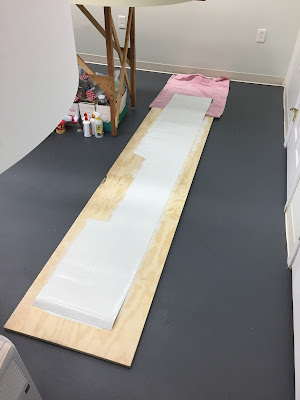 Though I could certainly have cut it myself, I had the store rip cut a 4x8 sheet of 2" foam into two 4x4' sections. Made it easier to transport home too. Then I painted it on both sides with brown flat latex paint. That seals the foam, and makes it look nicer. 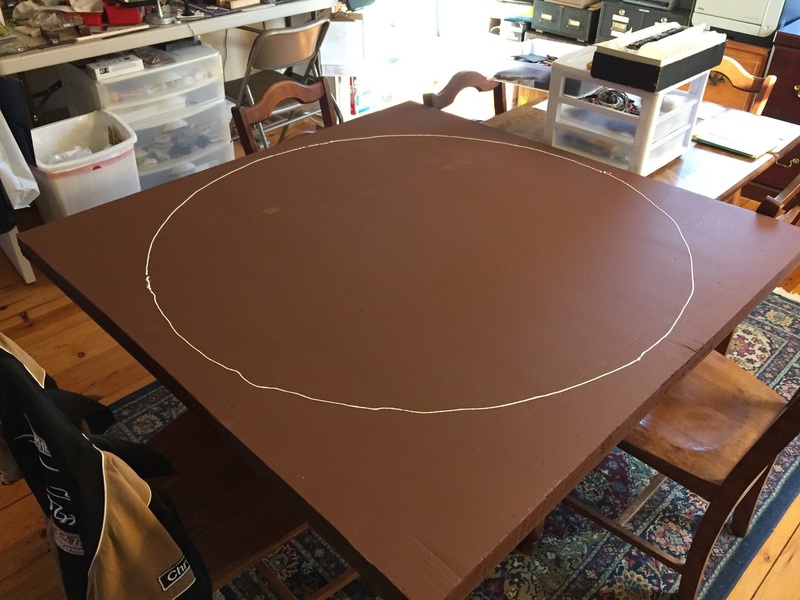 Next, I put together the Atlas track sections (note that it takes 16 sections to make a circle, so you'll need 3 packages of 6 to make your circle, and you'll have two sections leftover), traced the outline, removed it, and put down a bead of glue. 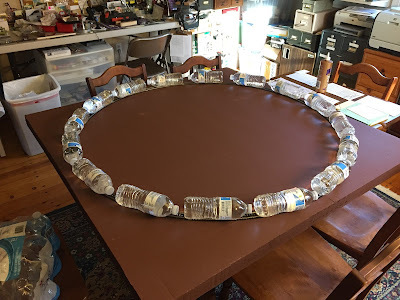 After spreading the glue with an old business card, I reassembled the track - including two terminal joiners I had on-hand (you could just as easily solder feeders to the track) - and weighed it down with the waterbottles while it dried. Voila! A nice - albeit a bit large - test loop. You can see here that I've connected the Lokprogrammer to my laptop and to the track. Now I can program the decoder and make changes without having to worry about the engine flying running off the end of the track. What's your DCC testing/programming setup look like? Let me know if you have any additional tips or suggestions you've found especially helpful. After my last operating session - and given how far along the Saybrook Scene has developed - it was high time to think about adding a valence to frame the scene. The typical approach to a valence is to mount masonite above the layout in much the same way as it's used as fascia to frame below the layout. But I have a finished, drywall ceiling and - as luck would have it - my ceiling joists run the wrong way, which makes it difficult to mount anything of any real weight, It's hard to screw mounting brackets into joists/studs when you a) can't find them, or b) they aren't where you need them. So I decided to take a different approach. 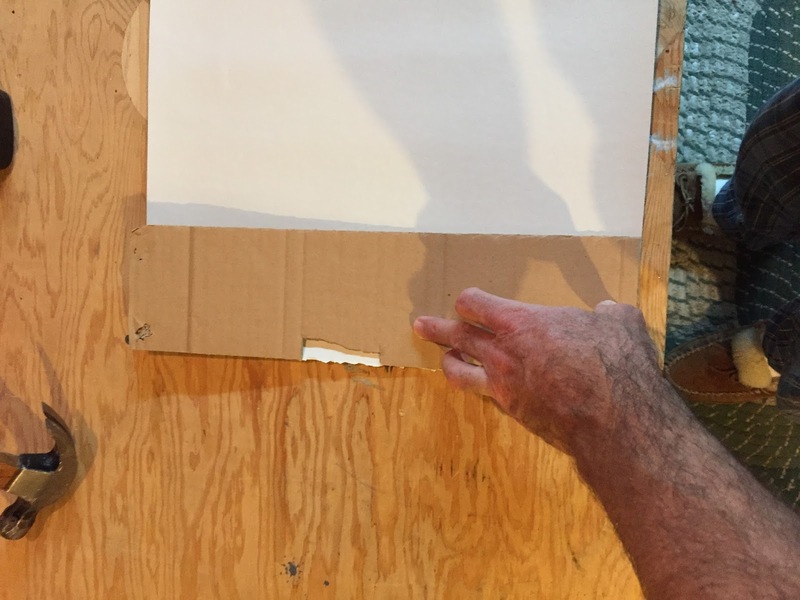 First, I traced the footprint/border of the fascia onto cardboard to create templates. I then used those templates as cutting guides to cut strips of 3/4" plywood to match the fascia curves. 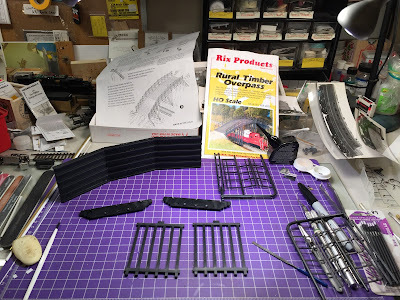 I used 3/4" plywood a) since it'd be easy to cut into curves (it's hard to curve 1x3s), and b) the 3/4" thickness would provide a convenient surface to which I could staple the vinyl. The pictures tell (most of the rest of) the story. . . 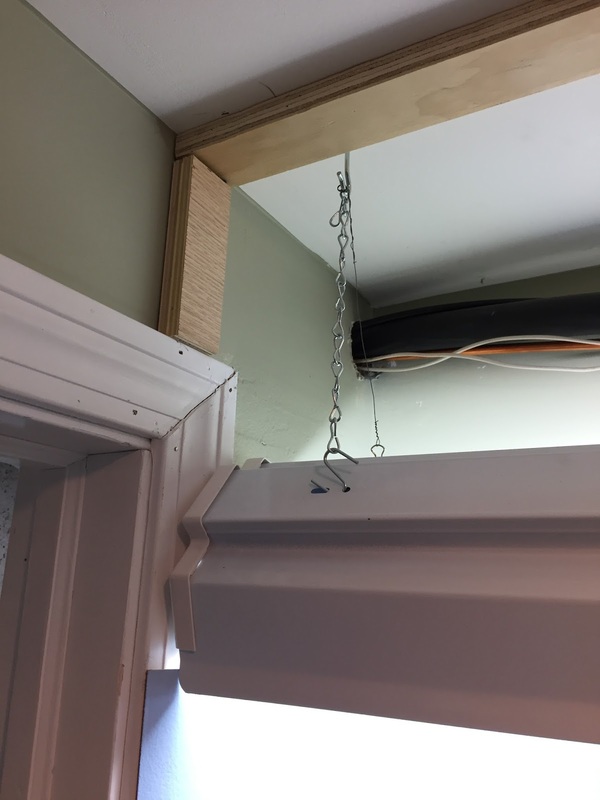 I was able to screw into joists at both ends, then lightly screwed into drywall just to keep the plywood from sagging at all. 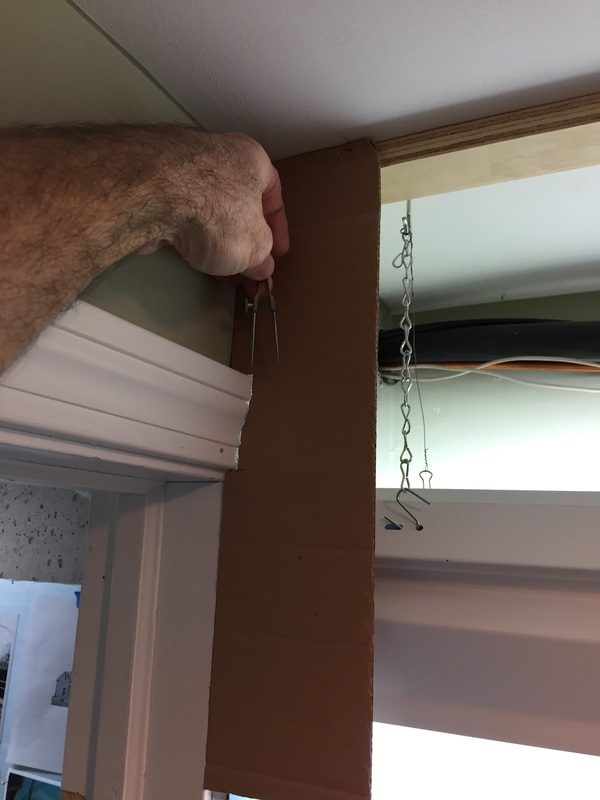 I was able to determine precisely where to locate it by using a plumb bob, rubbing against the face of the fascia and marking the ceiling directly above the edge of the fascia. And here is the plywood taped to the drywall that encloses the ductwork. If I tried to remove this, it'd probably take down the drywall! It'll be more than sufficient to hold up vinyl. Here's a view of how the plywood valence mount matches the fascia. Again, I traced the outline onto cardboard to make cutting templates. And here it is mounted on the ceiling. Since I actually found joists here, I was able to go ahead and use screws. 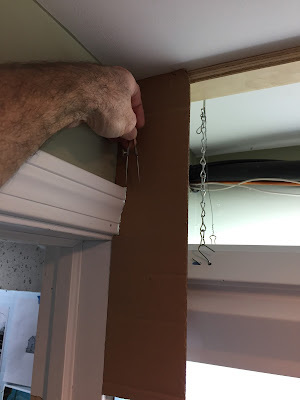 Again, I located the plywood on the ceiling by marking it from the fascia using a plumb bob. I did use the tape again to mount the vertical, edge mount/backing though. I used a piece of cardboard and a compass to trace the irregular edges I needed to cut around (primarily the door frame). The valence itself is a 6'x9' sheet in a roll I got at Lowe's for $25-30. 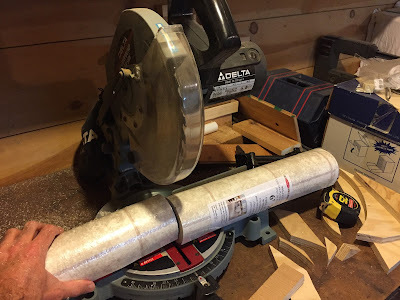 I used my chop saw to cut it into 16" sections, which would result in a 16" valence. Then I used the cardboard template I'd made around the door frame to cut the end of the vinyl to fit. As you may have noticed in the chop saw photo, there is of course a pattern and color on the "top" side of the vinyl. 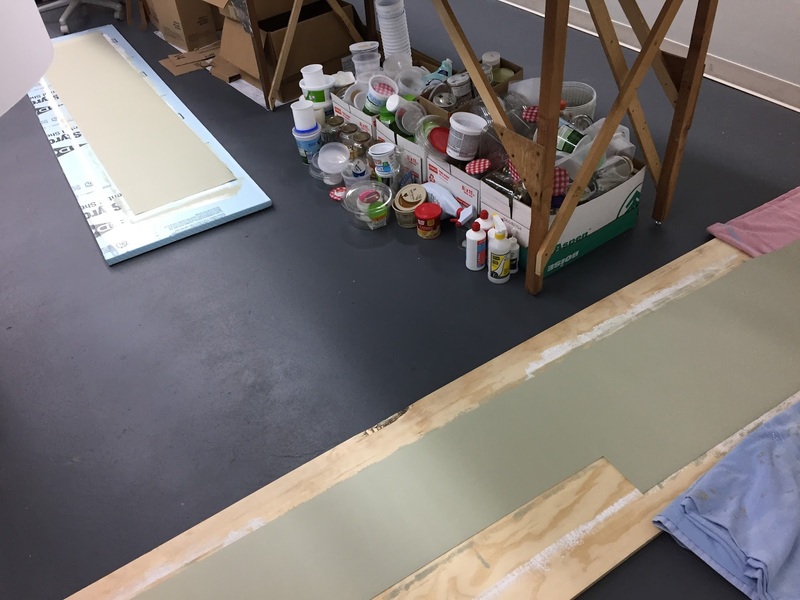 I plan to have this face "in" toward the layout, becoming the back of the valence, and used flat white ceiling paint to reflect as much light as possible. After two coats of white, I flipped the valence sections over and painted the bottom (now front) side to match the fascia color. 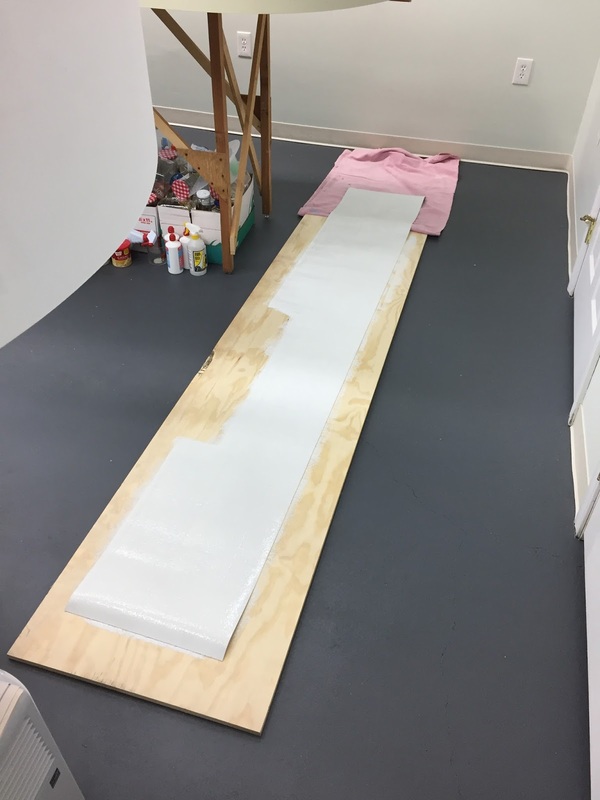 Pro Tip: you can use a section of foam as a portable painting support. That's where things are now until I can get the Missus to help me with the actual mounting. That should be MUCH easier than mounting much-heavier masonite, but still awkward enough to make an extra set of hands pretty helpful. 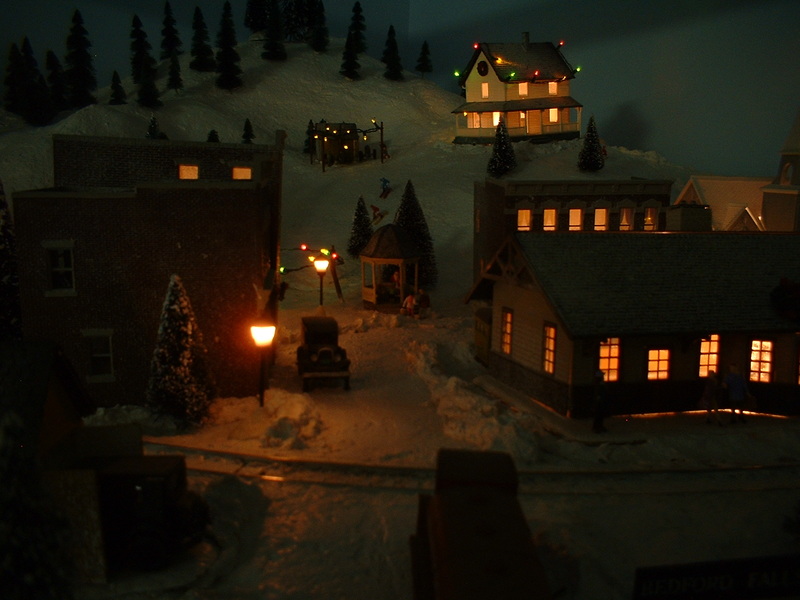 So while I was literally waiting for the paint to dry, I decided to start a little Christmas module/diorama/display to put at the top of the stairs outside the Photo Library room. First step, figure out the outline, traced on masonite. You may recall I have/had a Christmas Layout at one point. Click here for a photo. It was 3'x4' and represented my first actual completed layout - scenery, buildings and everything! Didn't matter it was only a loop of track - it gave me a lot of joy. 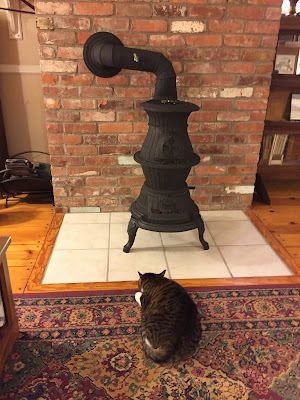 But it was awkward and bulky and always seemed to be in the way. I put it on rollers at one point so I could wheel it around as needed. But it was too wide to get through a standard doorway without tipping on its side (after removing the legs), so it was trapped in one of the basement rooms. Not great for display. 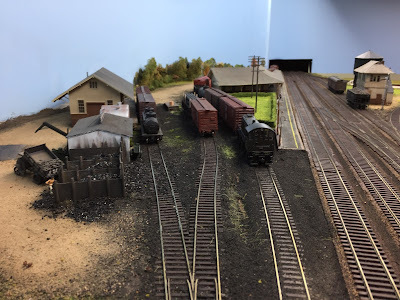 So a few months ago, I dismantled it - regaining the space permanently - and decided to reconstitute it on a display that could be out for more folks to enjoy. 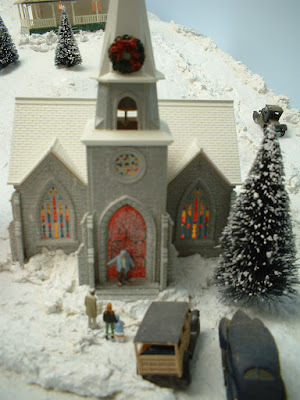 It'll be a fun little project - just hope I can get it done in time for Christmas! All in all, a pretty productive weekend!